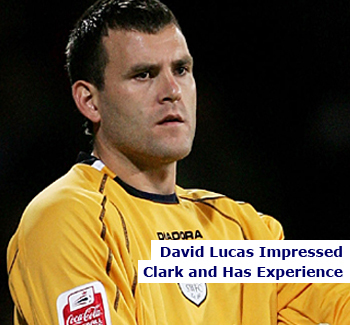 Birmingham City manager Lee Clark has explained the reasoning for bringing goalkeeper David Lucas to St Andrew’s. The experienced 34-year-old former Preston shot-stopper has signed a 12-month contract at Blues following his release by Rochdale in May. “He always impressed me playing for Swindon Town against Huddersfield,” Clark told the Birmingham Mail. “He’s got a lot of experience and he’s a very good player. “Yes, he’s 34 but in goalkeeper terms he’s possibly got another five, six, seven years ahead of him. David adds to the competition. You need to have three goalkeepers as you don’t want to be left short and trying to find someone in the loan market if you get injuries. “And also when we play Barnet (in the first round of the Capital One Cup), we could lose Jack Butland on England international duty. “You need senior goalkeepers, you never know what could happen over the course of the season,” Clark said. David Lucas began his career at home town club Preston North End. He spent 10 years at Deepdale where he represented England at U-20 & U-21 level. Whilst at Preston he spent loan periods at Darlington, Scunthorpe United and Sheffield Wednesday before moving to the Hillsborough club in 2004 on a permanent basis. The 6’ 1” keeper has also played for Barnsley (2007), Leeds United (2007-2009) and Swindon Town (2009-2011) before joining Rochdale at the beginning of last season as player/coach. This entry was posted in Birmingham City and tagged birmingham city fc, david lucas, lee clark. Bookmark the permalink.